Back in October last year, I received some gorgeous buttons from the Jellywares Yarn Club and used them to make this button heart wall hanging. Then in December, our Sewbox included some gorgeous linen fabrics along with some large wooden buttons of differing designs that had me thinking how they could become another heart hanging. One of the linen fabrics had a Paris theme, just perfect for button hearts being the city of love. January's box included some small wooden/shell like buttons I knew would be ideal to add to the larger ones. I also had on hand some cute colourful small flower shaped buttons and bright varigated cord that I had been pondering how to use so decided to make a mini hanging but with this one I tied the buttons on with the cord, knotting them to the fabric. The possibilities are endless for button heart hangings depending on the style, colour or design of buttons. The hangings can be attached to a feature hanging rod or stretched over an artist's canvas. For this tutorial, I take you through the steps for the wood button/linen one using a hanger but the instructions can be adapted to suit the finished size you wish to achieve or finishing technique you want to use. 1. Choose size of hanging (for this one I cut an 8" square and my frames were cut 4 1/2" wide to showcase the Paris print. This also ensured the finished hanging would fit the 14" hanger I had on hand). If frame fabric is directional or has a feature print, plan layout of frame pieces & choose width to suit fabric pattern or hanger. 2. Sew side frame pieces to central square using 1/4" seam & press to frame piece. 3. Add top & bottom frame pieces, press to frame piece & trim if needed. 4. Cut interfacing/wadding to size of front piece. 6. Now comes the fun part - planning the layout of your heart shape. 7. Hint - take a photo of your layout if possible, this really helps when stitching the buttons on to check your design progress. 8. Mark the position of your buttons - for this hanging I was happy using a lead pencil knowing the colour of thread I was using would hide the dots. As you mark your button position, move them across onto a piece of card. 9. Attach the buttons using 2 or 3 strands of embroidery thread. This is where that photo you took comes in handy to check position of buttons. 10. Check your progress - for this hanging I decided something extra was needed and added the 4 buttons on the corner of the central piece to frame the heart. Do a final trim if necessary. 11. The Backing - cut a piece as wide as your front piece but 1/2" longer. About 1/4 or 1/3 down from the top, cut across the width of the backing piece. Join the two pieces together using a 1/4" seam but leaving a gap in the middle of the join (you will be turning the hanging through this join so leave at least 4 - 5"). Press the seam to one side. Note the gap. Trim the corners, turn through and press. Close the gap on the back piece using a ladder stitch. 13. Attach your hanger and your button heart hanging is ready to display. * For my original pink heart, you will see that one was outlined with hand quilting in a heart shape using 3 colours of thread to compliment the buttons. *For the pink heart, my middle section was cut 7 1/2" x 8" and the frame cut 2" with the zig zag pattern of the fabric going opposite direction to the centre panel. *If using an artists canvas to mount your hanging, you will need to allow enough fabric to fold over to the back to staple to the canvas. It is better to use a thinner wadding or interfacing is attaching to canvas. *Use a water soluble pen to mark the centre points of the fabric to ensure the heart is centered when attaching to the canvas - you can see the purple marks on the yellow fabric. *If you want to achieve the frame effect such as on the example above, I cut 1 1/2" wide strips across the fabric then ironed each strip into thirds & stitched to the fabric using a walking foot once the interfacing had been added. 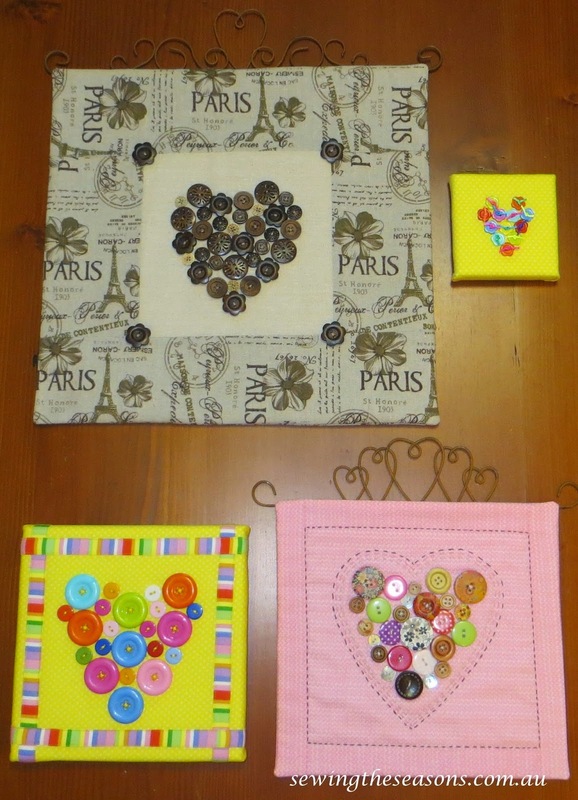 I would love to see any button heart hangings you create, don't forget to pop back & post a photo!